Any "inside" news on this? Why no construction? They're gonna have to change the "Available Fall 2014" date on their sign to "We Hope to Start Construction by Fall 2014". Our region could open a specialty museum collecting out-of-date construction start signs. No shortage of interactive exhibits. Nope. All quiet on that front. If this project had started construction already it would have been difficult with the bridge construction going on as well. Right now Harbour Road is closed at this end and all torn up. They are in the process of tearing up Harbour Rd. leading to the intersection. Cyclists are being diverted onto the sidewalk and the area by the large sign is narrow so many are walking their bikes. I noticed the sign now says "Available September 2015." Right, it's changed recently hasn't it? No news on this end. Big disappointment they havent secured tenants thus far. A little sign nostalgia from June 2013. Their project web site still lists this one as starting in the Spring of 2014. Of course the "current" sign lists availability as Fall of 2015, which is just 10 months away - missed again. I find the URL really weird. 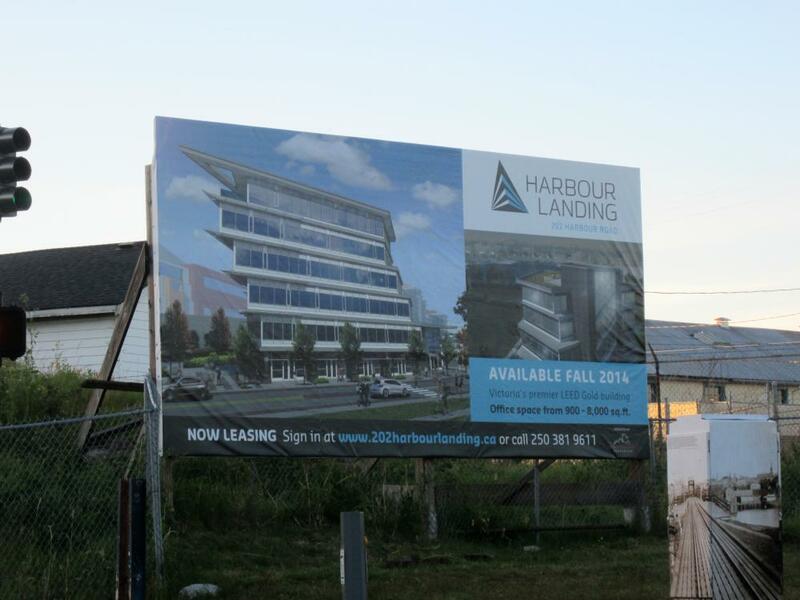 The address is 202 Harbour Road and the building name is Harbour Landing, but the URL is www.202HarbourLanding.com. That's never a good sign, Gary! I dont see it as a bad sign. Developments get put on hold all the time. It is a prime piece of land. I am sure they are waiting for the Johnson st. Bridge to be finished or could be changing their plan to condominiums as the office market is incredibly dry right now. Who knows maybe they are waiting for Bayview to build a few more buildings and services like doctors, dentists, lawyers etc. will be attracted to the area because of the residential nearby. This one is far from dead and gone. Edited by Mixed365, 01 December 2014 - 09:28 PM. I think the owner of this property saw Dockside Green getting started again and did some hocus pocus work to perhaps make their land of possible interest for purchase. 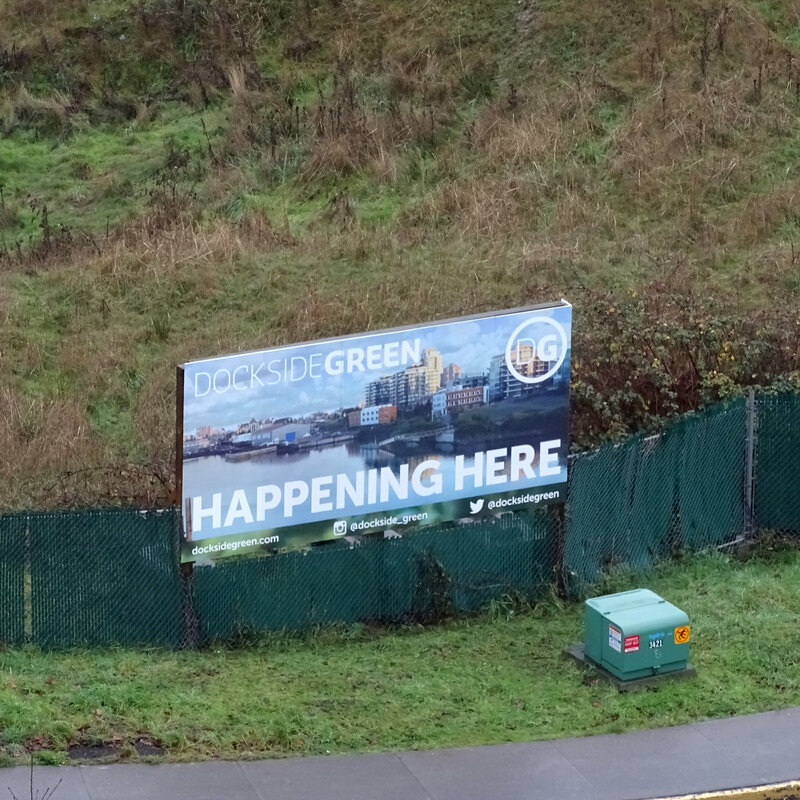 The Dockside Green "Happening Here" sign (as seen here on the Tyee Rd. / Esquimalt Rd. corner) has replaced the Harbour Landing sign. I didn't have my camera so I'm just using the other shot. 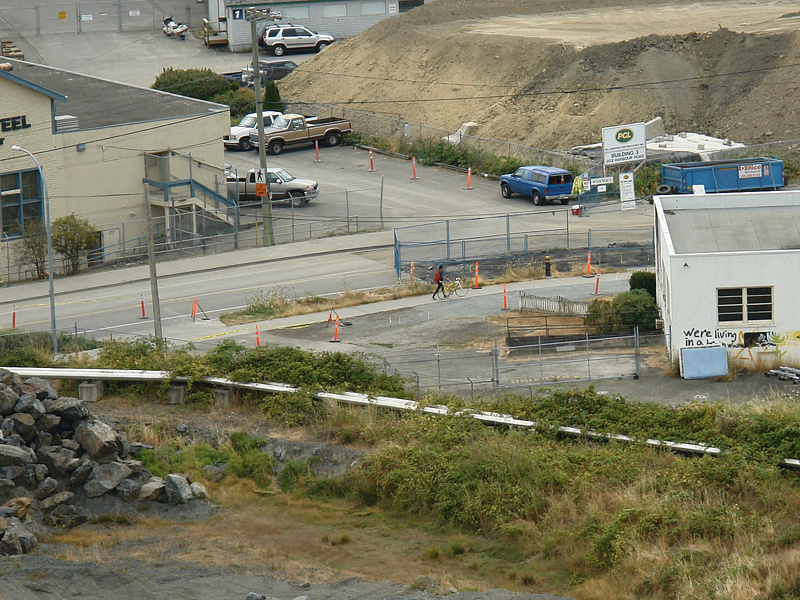 I guess this implies Harbour Landing is NOT happening here. Edited by Gary H, 10 December 2014 - 05:01 PM.